Everest Base Camp via Kalapathar trek (EBC) is one of the most popular adventurous trekking trails in Everest or Khumbu region. The trekking takes you to Kalapathar (5545m) the single most important vantage point to watch Everest in its entirety. EBC trek has been listed as World’s Top Ten Treks by National Geographic and Top 50 Places To Visit Before You Die BBC. Since this is at one of the highest altitude regions, the trek is of fairly strenuous grade and very demanding. However, you are bound to be rewarded with stunning views to be seen from nowhere which is absolutely worth it. Panoramic views of Eight Thousanders from of of the popular view point, the Kalapatthar. Challenging and thrilling experience while climbing 6654 meters. One of the best rated adventure. Know the culture and tradition of legendary and brave Sherpa people. Our representative will meet you on your arrival at the Airport and transfer you to the Hotel. An information session about the program will be conducted by our Tour Guide. Overnight stay in Hotel. 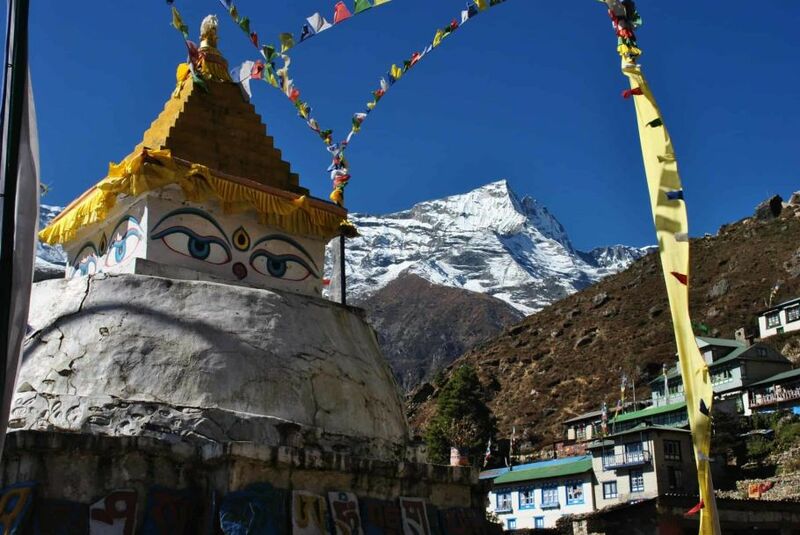 Suggested activities on this rest day include a short walk uphill to the Sagarmatha National Park Headquarter, a magnificent spot perched on top of Namche Bazaar with the breathtaking view of the surrounding snowcapped giants and the valleys below. We will visit Sagarmatha Museum that consists of information regarding the history of the Himalayas, geographic, culture, mountaineering flora, and fauna of this region. The afternoon is spared for leisure. The walk is fairly easy for the first half, as trail sees few ups and downs overlooking magnificent view of Everest, Nuptse, Lhotse, Ama Dablam, Thermasharkhu, and Kwangde-Ri peak. After two to three hours we will reach Phungitenga (3,250m), a small settlement with a couple of teahouses and a small Nepalese Army barrack in the midst of the alpine woods of mostly silver fir blue pines, rhododendron and some few magnolia and birch trees. Walk from here is strenuous and involves an hour or two on the winding trail through the shade of woods till we reach Thyangboche Monastery or Gompa, our overnight spot. This beautiful spot offers views of the majestic beautiful peak of Ama Dablam with Everest looming above the Nuptse wall in the north and Mt. Lhotse and Lhotse Shar towards the northeast. Today our trail descends to Dingboche, a small village with Chortens and Mani stone walls and nunnery. Further, ahead we will cross a suspension bridge over Imja Khola and gradually ascend to Pengboche with the towering view of Ama Dablam, one of the most beautiful mountains in Everest region. Trail continues along Imja Valley opening up into the confluence of Imja River and Lobuche river and then to Dingboche. Dingboche is the last Sherpa settlement with beautiful terraced field enclosed by the stone wall.Barley, buckwheat, and potatoes are some local major crops. We will take a complete rest day at Dingboche, however, we will take the time to explore the area. The valley offers some good views of Ama Dablam, Lhotse, Imjatse Peak (Island peak), Makalu et al. After early morning breakfast, we start our trekking towards Lobuche. For a first few minutes, we walk through the romantic Yak grazing yields with the consistent views of Tawache peak & Cholatse, until a wooden bridge. Further, from here, the trail leads to the Khumbu Glacier with impressive views of Khumbutse (6623m), Lingtren (6697m), Pumori (7145m) and Mahalangur Himal. Another hour’s walk upstream, we reach Lobuche, our overnight stop. The first hour of today’s walk involves gradual ascent along the grassy field past a mass of rocky moraine. You will be able to see icy-glacial pond and icebergs down below Khumbu glacier. A short downhill walk from here will bring you to Gorakshep, on an almost flat land that forms the base of Kalapatthar (5545m) and Mt.Pumori (7145m). Gorakshep hosts three teahouses where we take a longing break. Before long we will continue our journey towards the Everest Base Camp and further to the Khumbu Icefall. The track to the base camp is often misleading, so we will follow our lead Sherpa. Every year the trail changes due to the movements of the glacier. This stretch of the walk is quite strenuous due to high altitude and thin air, and also as it passes over rocky dunes and moraine and streams, until the base camp. Once you reach EBC, a great view of the Khumbu icefall awaits you. Later we will retrace our journey back to Gorakshep for overnight. We will wake up before dawn and begin our prized journey towards Kalapatthar. The walk will be physically quite demanding, however, it is worth a lifetime. On reaching the top ridge of Kalapatthar, a rocky peak on the southwest ridge of Mt. Pumori, you will be awestruck by the spectacular views of Everest, Lhotse, Nuptse, and Leo-la. Watching the sunrise over Everest is one of the most extraordinary highlights of this trek. The view of Everest Base camp down below on the moraine of Khumbu glacier is equally superb. Spending a wonderful time here we will descend back to Gorakshep and then continue walk to Pheriche. The walk is mostly downhill and will reach Price, our overnight stop, by afternoon. We will be trekking to Namche Bazar from Phirche. We will have to cross Pangboche and then Tengboche today. On the way, you can see beautiful Rhododendron and Juniper trees. We will have our lunch on the way. After crossing the Prayer Flag Festooned Bridge over Dudh Koshi River, we will move along the River trail then reach Sansa, a major trial junction in this area. Then we will reach Kyangjuma (3570m) from where we can see the beautiful Ama Dablam, Nuptse, and Thamserku. Then we will walk down toward Namche. On the way, we can see wildlife like mountain deer, snow leopard etc. On reaching Namche, we will relax and stay the night there. Kathmandu International Airport Arrival & Departure Transfer by Private Comfortable Car / Van / Hiace. Accommodations Twin Sharing Basis in Kathmandu at 3 to 4 Star hotel. Round trip Land or Air Transportation as per the destination and itinerary. English Speaking experienced Trekking Guide (Govt. Trained/Licensed Holder), one extra assistant trek leader for above 8 pax group. 1 porter for 2 people basis (Carry max. 25kg per porter) during the trek. One day sightseeing of Kathmandu valley. Note: Entrance fees are included with this package. Down Jacket, sleeping bag, Osho Adventure trekking kit bag/duffel bag, First Aid Kid Box (for Normal Treatment), T-shirt and Trekking maps. Note: Down Jacket, Sleeping Bag and Trekking Kit Bag/Duffel Bag must be returned to the company after completing the trekking. Emergency helicopter rescue Evacuation Coordination Service (This is only in case of Emergency condition of guests, however, all guests are responsible for paying helicopter Evacuation Charge- US$ 2500 per/Hour if necessary. So all our valued guests are kindly advised to make sure that they have necessary Travel Insurance which should cover here Evacuation expenses in case needed). Lunch & Dinner in Kathmandu – keeps $ 5 to 10 for per meal in Tourist Restaurant. Extra accommodation in Kathmandu and Pokhara in a case of early return from trekking than scheduled itinerary. Personal expenses such as the phone calls, laundry service, the internet, bar bills, battery recharge, hot shower, etc.